The Weave Bridge is a 145 ft (44 m) bridge at The University of Pennsylvania, USA which was conceptualized by Cecil Balmond and engineered by Ammann & Whitney. It was commissioned by the University in 2007, and opened in June 2009. The bridge creates a pedestrian passage over the Amtrak train tracks that currently separate the main campus from athletic fields along the Schuylkill River. The design features a "braided rope" structure consisting of six steel strands. It marks the first milestone in the University's plan to transform a former postal depot into a 24-acre (97,000 m2) complex, called Penn Park. 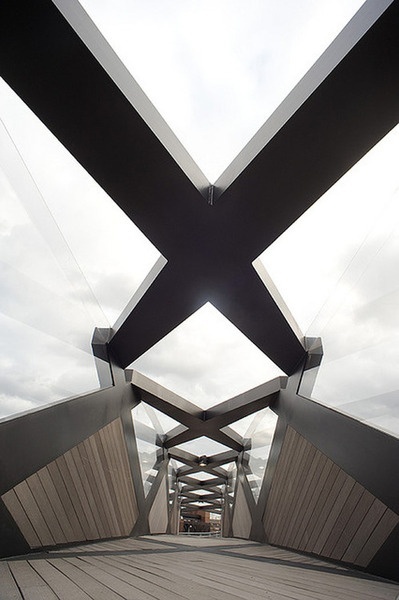 The design uses a "never before used bridge structure" It is in keeping with Balmond's purusal of a "non-linear world, and his principle that "structure as conceptual rigour is architecture." His dynamic and organizational approach to structure is informed by the sciences of complexity, non-linear organization and emergence.